There’s a good chance you’ll find your answer in our FAQs or please submit your inquiries or comments by clicking on the Contact Us button below. 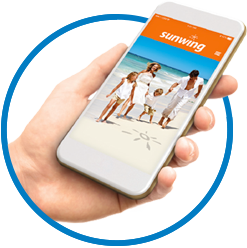 Sunwing does not engage in 'robocalling' or any form of phone promotion or solicitation of this nature. If you do receive a 'robocall' pretending to be calling upon our behalf, we would encourage you to report it on line to the Canadian Anti-Fraud Centre via their secure link here or by giving them a call on 1 888 495 8501.